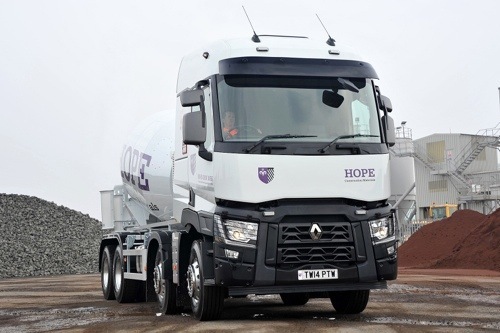 Cardiff-based P&T Woodruff Haulage Ltd, contract haulier for Hope Construction Materials, has taken delivery of the UK’s first Renault Trucks Range C430 X Load 8×4 with a McPhee Mixers (Glasgow) 8 cubic metre concrete mixer. Supplied by Renault Trucks Cardiff on a five year contract, the Range C, with high roof sleeper cab and lightweight pack including aluminium wheels, fuel tank and air tanks, is an addition to P&T Woodruff Haulage’s fleet, reflecting strong trading conditions in the construction industry. 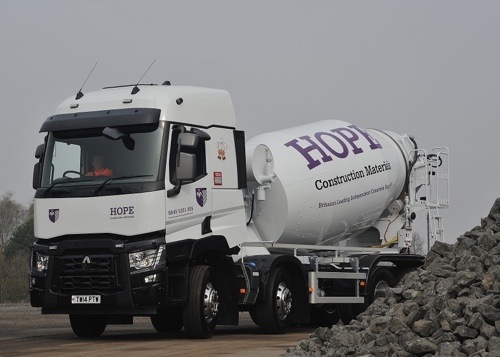 The Range C, in Hope Construction Material’s distinctive white and purple livery, went on the road in April, operating across the South from Wales to Kent, servicing Hope Construction Materials’ network of ready-mixed concrete plants. This is the third Renault truck on P&T Woodruff Haulage’s fleet and follows the very positive experience of owning and operating two Renault Premium Landers. This entry was posted in NEWS, Renault by truckbloguk. Bookmark the permalink.